For years, medical schools have looked favourably on applicants with work experience. Not only does it demonstrate applicants’ commitment and an early interest in the discipline, it also helps to provide a realistic insight into medicine as a career. In a number of specialties recruitment and retention of junior doctors is continuing to raise concerns,1 and one of these is psychiatry. Could encouraging sixth form students to consider work experience in psychiatry, or indeed any other specialty, be a practical step towards tackling this problem? We decided to set up and evaluate a work experience scheme in Birmingham and Solihull Mental Health Trust, the largest mental health trust in the West Midlands. No formal system existed for work experience in the trust, although some sixth formers had gained placements through informal contacts. We wanted to be sure that all local school pupils had the opportunity to participate in work experience through our scheme. In June 2009 a letter was sent out to all sixth form schools in Birmingham and Solihull giving details of work experience opportunities available in the trust. Priority was given to students who wanted to consider medicine as a career and who had an interest in psychiatry. Students were offered a three day work experience placement in several specialties, including general adult psychiatry, older adult psychiatry, neuropsychiatry, substance misuse, and liaison psychiatry. Students were able to observe outpatient clinics, inpatient assessments, and domiciliary visits. Teaching was provided by the consultant supervisor and members of the psychiatric teams. Between June 2009 and December 2011 a total of 60 students took part in the scheme. Thirty nine students (65%) completed an evaluation form devised by the authors to assess what the students thought about their work experience placement and what effect it had had on their views of psychiatry. 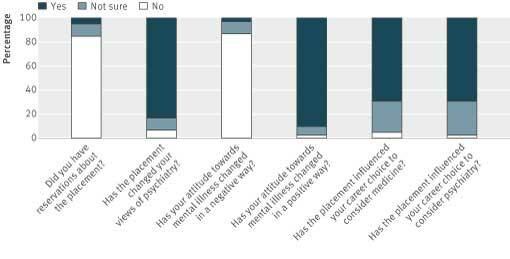 The work experience placements had a positive influence on the students’ attitudes towards mental illness and on medicine and psychiatry as a potential career choice (fig 1⇓). All the students said that their experience within the trust was good or excellent. A total of 80% and 87% of students were happy with the amount of information received and the structure of the placements, respectively. Teaching was believed by most to be at an appropriate level, and all students who completed an evaluation form thought that the placement was interesting. Students’ responses to free text answers on “knowledge and skills learnt” indicated that it was not just the knowledge they acquired that was important, and the students highlighted the importance of skills such as empathy and communication and also the breadth of the field of psychiatry. “I valued the experience more than any knowledge (factual) I got from it,” was one comment. “This was fascinating, as psychiatry is like being a detective,” said another student. When asked to document aspects of the placement that were not enjoyable, most answered “nothing,” and the negative comments they did give were concerned with logistics: travelling, paperwork, or placement length. Indeed, nearly half the students thought that a three day placement was not long enough. Work experience in psychiatry has previously been described as a “no go” area, because of the difficulties in gaining the consent of patients.3 However, the same rules with respect to patient consent apply to medical students as to consultants: ask for verbal consent from patients before entering the room for clinics or ward rounds. In the case of patients who lack capacity to make such decisions, the decision to allow a work experience student or medical student to be present at assessments is made on a patient by patient basis, ensuring that this is not in any way detrimental to the patient or student. The placements were seen as a highly valuable experience by the students, who provided very positive feedback. Receiving encouragement from consultants, seeing patients respond well to treatment, and being involved in the care of patients have been found to improve intentions to pursue a career in psychiatry during undergraduate attachments; these were the sorts of experiences reported by the sixth form students. As experts in our fields, we all have a responsibility to make our specialties attractive to work experience students, medical undergraduates, and foundation year doctors. Attracting the best doctors will ensure that our patients receive the best care possible. Exposing school pupils to psychiatry is by itself, however, not going to fix the specialty’s recruitment problems. It is important that school pupils who obtain a place at medical school continue to be encouraged to choose a career in psychiatry. The students who decide not to do psychiatry or even medicine will at the very least have had the opportunity to be exposed to psychiatry in a positive way that may help to shape their attitudes towards mental health. Jaques H. Specialty training competition stabilises as applications and posts rise. BMJ Careers, 15 May 2012. http://careers.bmj.com/careers/advice/view-article.html?id=20007263. Jaques H. Royal college launches five year plan to increase applicants to psychiatry. BMJ Careers, 27 Mar 2012. http://careers.bmj.com/careers/advice/view-article.html?id=20007042. Cameron D. “Schoolboy on work experience saw my intimate examination.” BMJ Careers, 1 Sep 2007. http://careers.bmj.com/careers/advice/bmj.335.7617.s81.xml.